Comodo PositiveSSL Multi-Domain (UCC/SAN) is our cheapest and most popular Unified Communication Certificate (UCC) / Subject Alternative Name (SAN) option, due to its quick issuance and high 258 bit encryption strength. It is a very cost-effective solution, as you can easily secure multiple domains and servers with one single certificate, saving you the time that you would spend on multiple configurations and renewals. 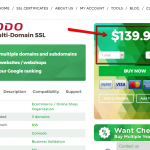 You’ll be able to secure 3 domain names by default, at the price displayed for this SSL certificate above. You can also secure up to 200 additional domains (SANs) at an additional low cost. Comodo (now Sectigo) is the unique Certificate Authority (CA) in the website security industry to issue SSL Certificates that are capable of securing up to 200 domains with one single certificate. Issuance time for this certificate is about 5 minutes. So as it is a Domain Validated (DV) SSL, it does not require any company documents verification. You will only need to prove the domain ownership by responding to an automated e-mail. After you install the SSL Certificate on your website and server, your website will display the “https” and the padlock icon in the address bar. You also get a static site seal which you can put in a preeminent place on your website, making users feel safer when sharing their sensitive information on your website. You will also get a $10,000 Comodo backed warranty, which will cover any damage that you may incur as a result of a data breach or hack that was caused due to a flaw in the certificate. Other benefits which you get when buying this certificate are: unlimited CSR reissues, unlimited server licensing, 99.3% compatibility with all desktop browsers, mobile browsers and server platforms. Our goal is your full satisfaction. That is why, we will offer you a 25 days money back guarantee policy, so that you can have peace of mind about getting the right website security solution. We will also give you 7% or 15% discount if you get this SSL Certificate for more than 1 year. Comodo PositiveSSL Multi-Domain (UCC/SAN) is the perfect security solution for any basic website or small business which is looking to secure information and boost sales. I secured several domains with this one certificate, and it worked great. Also, the price was really good when compared with other vendors. Thanks!! You won’t get a better deal for a Multi-Domain certificate. Grabbed it with both hands once I saw the price. had to get an ssl for 37 domains, and this looked like the best option. we spend a little bit more time setting up the DNS records, but I think it’s worthy for a all-in one solution. The Domain Validation (DV) SSL certificate is the most affordable choice for increasing the security of your blog, personal or small business website. Since there is no required paperwork, the process of acquiring the Domain Validation certificate is very quick and easy: you will have to prove that you are the domain owner just by responding to an automatic e-mail message. After a couple of minutes, you will receive the issued SSL certificate which can be installed immediately. Sites with Domain Validation certification can be identified by the green padlock that is displayed by most web browsers. This type of SSL certificates is recommended to be used if you need to prove that your site is secured, by having a secured connection. The Domain Validation certificates don’t display the legal entity, as the identity of the website owner is not checked while issuing them. So, if you have an e-commerce website or a site that collects users’ personal data, you should consider buying our Business Validation (BV) or Extended Validation (EV) certificates, which will make your site more trustworthy. How to pass the domain validation? When requesting an SSL Certificate you have to prove that you own or you have management rights over the domain or sub-domain that you are requesting an SSL Certificate for. If you have an SSL Certificate issued by Comodo/Sectigo, GeoTrust, Thawte, Symantec and RapidSSL, then you can complete the domain validation is by responding to an automated domain validation message sent to your email address. 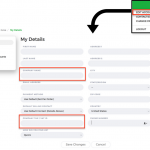 You will be given a list of emails to choose from, and the automated domain validation message will be sent to the email address that you choose. Always check your email address (including your Spam folder) so as you should receive an email message from the Certificate Authority with instructions on how to validate (prove the ownership of) your domain name. The email message will ask you to copy a unique code and paste it on a specific link provided in the same email message. The HTTP validation consists of uploading a TXT validation file to a pre-defined location on your website. You have to make sure that you can access this file and link from any web browser. Once you proceed with this domain validation method, Comodo/Sectigo will run a scan of your website and will look particularly for this file at the given link. Your SSL Certificate will pass the domain validation within a few minutes after Comodo/Sectigo’s system finds the TXT file on your website. The HTTPS validation method is the same validation method as described above. You should choose the HTTPS option if you already have an SSL Certificate installed on your website. Comodo/Sectigo allows you to to add a pre-defined domain record to your domain registrar (the website where you registered your domain name). Make sure that your firewall doesn’t block Comodo/Sectigo validation robot. Comodo/Sectigo validation robot comes from secure.comodo.net / 91.199.212.132. The user agent should be “Comodo/Sectigo DCV” or “COMODO/SECTIGO DCV”. Please note that newly added DNS records take between 10-48 minutes to propagate. This means that you will have to wait up to 48 hours to pass the domain validation if you go with this method. That is why we recommend the Email, HTTP, and HTTPS methods better, so as they would allow you to pass the domain validation instantly. How to change the domain validation method? If you chose one of these domain validation methods described above, and you see that your domain doesn’t get validated, then you can always change your domain validation method. Please go to this link to learn how to do that. What documents should I provide for a Domain Validated SSL Certificate? In order to buy a Domain Validated certificate, you do not need to provide any documentation. You will have to confirm the domain ownership through a simple email or file-based authentication. Following completion of one of these elements, the DV certificate will be signed and released to you. 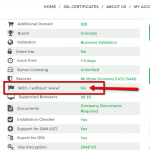 What is a Multi-Domain or SAN SSL Certificate? The Subject Alternative Name (SAN) SSL certificate, also called the Unified Communication Certificate (UCC) or the Multi-Domain SSL certificate was particularly developed to secure all your domains and subdomains by owning one single SSL certificate. This type of certificate ensures the security for both, your internal and external domains/subdomains and is fully compatible with your Microsoft Exchange products and Microsoft Office Communications Server. UCC/SAN SSL certificates are not just easy to be managed but are the most cost-effective option. 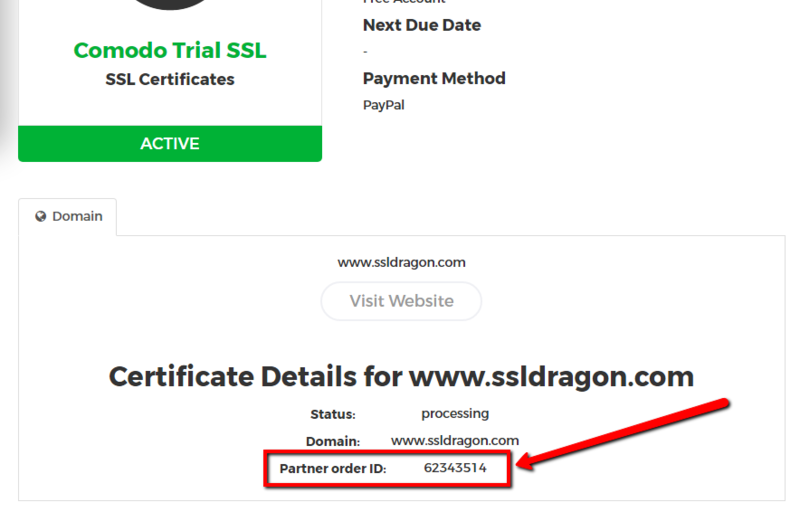 These certificates give you the opportunity to secure your main domain, for example, ssldragon.com, together with many other totally distinct domains, like ssldragon.net, ssldragonsslcertificates.com and its subdomains mail.ssldragon.com and account.ssldragon.com – all with 1 single certificate. Besides, unlike Wildcard SSL certificates, UCC/SAN certificates are available in all three validation methods: Domain Validation (DV), Business Validation (BV) and Extended Validation (EV). You can find our full list of Multi Domain (UCC/SAN) SSL Certificates at this link. What domains/sub-domains can I secure with a Multi-Domain (SAN) SSL Certificate? A Multi-Domain (SAN) SSL Certificate is specifically created to allow users to secure multiple domains and/or multiple sub-domains with one single SSL Certificate. Depending on the SSL Certificate product and brand, the certificate will include a different number of additional domains (called SANs) at the price quoted on the SSL Certificate’s details page (see screenshot on the right). NOTE: Here is how you should configure your Multi-Domain SSL Certificate on our website: When you generate a CSR (Certificate Signing Request), please include one single domain name or sub-domain in it, such as: www.example.com. The rest of the domains or sub-domains, which are called SANs (2nd, 3rd, 4th domains or sub-domains) should be included in the fields for additional domains. 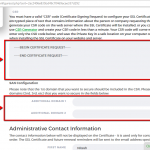 You will see the fields for additional domains on the SSL Certificate configuration form, right under the text area for the CSR (see screenshot on the right). Can I secure site.com and www.site.com under 1 SAN (domain)? When you buy or configure your Multi-Domain (SAN) SSL Certificate, please note that most Multi-Domain Certificates do not secure the domains with and without “www”. With other words if you want to secure both, example.com and www.example.com under one single Multi-Domain Certificate, that will be considered as two different domain names. The screenshot on the right shows you where you can find the attribute that tells you if your Multi-Domain Certificate secures both “www” and “non-www” under one single domain (SAN), or not. Anyway, that is not a problem so as you cannot have the same website open both as www.example.com and as example.com. All website owners only choose one of these options and make the other option automatically re-direct to the other. For example, you can choose your website to always open at www.example.com and anybody who enters on example.com is automatically redirected to www.example.com. In this way, you only have to secure one domain, and that is: www.example.com. Can I add another domain after the SSL Certificate has been activated? The multi-domain certificate can be initially activated for the primary domain name. 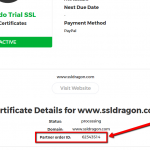 If you wish to add more domains later, you need to reissue the certificate in your SSLDragon.com account. Why does the domains validation for my multi-domain SSL Certificate take so long? When you buy a multi-domain SSL Certificate and you include several domain names and/or sub-domains in it, the Certificate Authorities require you to pass the domain validation for each and every domain name and/or sub-domain that you included in your multi-domain SSL Certificate, and only after that the multi-domain SSL Certificate will be issued to you. POSSIBLE PROBLEM: Sometimes the email addresses, or your HTTP options, or the DNS records that you choose for your multi-domain certificate do not get set correctly when they reach the Certificate Authority. You will know that when you see that you only got one single domain validation message to your email address instead of getting several domain validation messages, or your multi-domain SSL Certificate’s status still shows as “Awaiting Validation (Full)” even though you passed the domain validation for one of the domains. HOW TO FIX: There is an easy way to fix that, and that requires getting in contact with the Certificate Authority’s Validation Department. When you contact them, please provide them your “Partner Order ID” (see screenshot on the right), and then tell them about the domain validation method that you chose to go with: HTTP, DNS or Email. If you chose to pass the domains validation by email, then double check with the Validation Department representatives what email addresses are set in their system, and ask them to send you the domain validation messages to your desired email addresses. Please call Comodo/Sectigo Validation Department at +1 (888) 266-6361 (Ext 4) or https://sectigo.com/about/contact for the above stated reasons. When you talk to them, you will need to provide them your “Partner Order ID”. Please call Thawte, GeoTrust, Symantec/VeriSign Validation Department at +1 (520) 477-3152 (Ext 2) for the above stated reasons. Please note that Thawte, GeoTrust, Symantec/VeriSign are all owned by Symantec, and they all have the same phone number provided above. When you talk to them, you will need to provide the “Partner Order ID”. Can I receive a refund for the unused domains on multi-domain certificate? Yes, you can receive a refund for the unused additional domains that you bought. If you have already activated the SAN for a particular domain name, than you cannot be refunded for that specific domain name, unless you accept to take off that SAN/domain from multi-domain certificate. Can I use an SSL Certificate for multiple domains on same IP address? The Multi-Domain (UCC/SAN) SSL Certificate allows you to secure multiple domains or subdomains which are hosted either on one IP address or different IP addresses. This SSL Certificate type was particularly designed to secure multiple websites within one single SSL Certificate as an easy-to-use and cost-effective solution. How to add the VAT Number and Company Name to my invoice/account? Fill in these fields with the necessary information then click on ’Save Changes’. After you perform the above steps, your SSL Dragon account and all your invoices will be automatically updated with this information. How can I install my SSL Certificate? There are many different ways to install an SSL Certificate, and they all depend on your SSL Certificate brand, the web server type, the operating system on your server, and the web hosting panel that you have on your server. These being said, please check our Installation Articles to get detailed instructions on how to install your SSL Certificate on about 44 different server types, hosting panels and operating systems. We always recommend you to get specialized help with you SSL Certificate installation. If you have a web developer, or a system engineer, then they would be the right people to help you with your SSL Certificate installation. If you want us to do the SSL Certificate installation for you, then we can definitely do that. We offer SSL Certificate installation services to our customers for a flat rate of $99.99 per domain per server. Need help securing your website? Have questions, or unsure which SSL to choose? Let our fearless dragons help you! Follow the following steps towards getting the type of help that you need. 6. Email us using our Contact Form.